At the end of September, the IRS released preliminary figures for year 2014 filers of Form 3520-A, “Annual Return of Foreign Trust with a U.S. Grantor”, as part of the “foreign trusts” section of its Statistics of Income series. Many international accountants and tax lawyers take the position that ordinary local tax-compliant savings plans held by U.S. persons in other countries, such as Australian Superannuation, are “foreign grantor trusts” which generate the obligation for their “grantors” to file Form 3520-A as part of a complete compliance diet if the “trust” itself does not file the form. 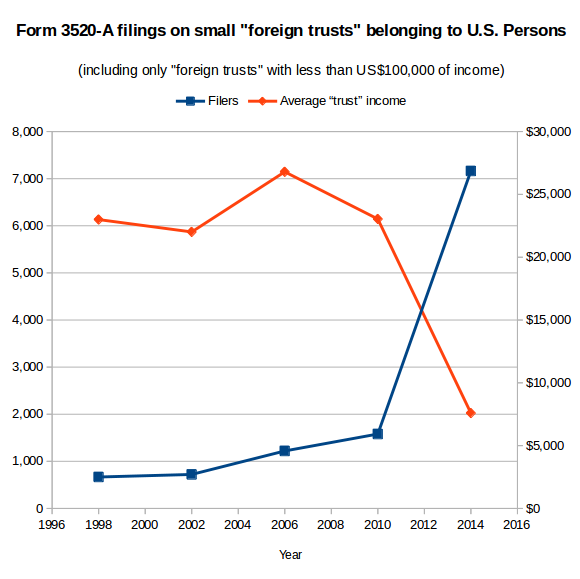 This early IRS release breaks down “foreign trusts” only by extremely broad income categories — to give you some idea of what Homelanders think we owners of “foreign trusts” are like, the upper bound for the lowest category (aside from the category for trusts with a loss of any size) is US$0 to $100,000. For purposes of this blog post I’ll call this category “small reporting trusts” (though the category is defined in terms of income rather than trust assets). The final release will probably only break that down as far as $0–25,000. However, we can still see two related trends: many more “foreign trusts” with income under $100k are reporting, and on average they have far less income and less assets than “foreign trusts” which reported in previous years. I expect that precisely none of these new “small reporting trusts” are actual Panama Papers-style offshore trusts with a professional trustee taking legal title to some assets and then managing them for beneficiaries according to local trust law — the fees for those would eat up all the income. Rather, their size — about the same as the average U.S. 401(k) plan — strongly suggests that these are normal retirement accounts, not tax-evading drug-dealing money-laundering terrorist-financing instruments. In simpler terms, after spending tens of millions on offshore compliance crusades, the IRS managed to dig up a bunch of local retirement plans which owe no U.S. tax. And awareness of Form 3520-A is clearly even lower: the number of Forms 3520-A being filed remains only a small fraction of the number of Forms 2555. (Even this growth seems to have caught the IRS by surprise: as recently as 2013, their Paperwork Reduction Act estimates stated that they expected only about five hundred 3520-As per year.) Does that mean that we should expect to see hundreds of thousands of new filers in the coming years? The five thousand or so people who filed Form 3520-A on their retirement plans in 2014 are an unusual group: they are the 0.1% of the diaspora who try the hardest to comply fully with the U.S. tax system. How big a group is five thousand people? Well, the FBI added 2,426 more renunciants to NICS in 2014 than they did in 2010 (source: NICS Operation Reports — 2009 p. 19, 2010 p. 18, 2013 section “Active Records in the NICS Index”, and 2014 p. 25) — and recall that NICS doesn’t include relinquishers. I suspect that many of the new Form 3520-A filers were among the uptick in renunciants — and that these new filers only accepted the maximalist-extremist position that their retirement plans were “foreign grantor trusts” because their compliance condor told them it was a prerequisite to getting a CLN and officially exiting from the absurd system in as clean a fashion as humanly possible. Some Homelanders love to repeat that out of the millions of Americans estimated to live in other countries, only a few thousand names show up each year in the Federal Register‘s list of ex-citizens — as if that’s an excuse for abusing the rest who don’t renounce. Yet comparing the number of Form 3520-A filers to the NICS renunciation figures suggests that something like half of people who try the hardest to comply fully with the U.S. tax system go and give up U.S. citizenship in the end. Either the burden of full compliance drives them to give up citizenship, or they are undertaking the burden only as a step along the way to giving up citizenship. As far back as 2010, it should have been apparent to the IRS that their Form 3520-A filing requirements were netting them an enormous amount of by-catch. The by-country breakdown — not yet available for 2014 — showed that the largest increase in 3520-A filings between 2006 and 2010 came not any of the traditional trust-forming Commonwealth secrecy jurisdictions like the Cook Islands or Belize, but rather Mexico. There were 509 Form 3520-As filed for Mexican “foreign trusts” in in 2006, and 2,144 in 2010. Most likely, these “trusts” were fideicomisos — structures used by non-Mexican citizens to hold coastal land in Mexico. Since then, the IRS clarified to one tax filer in a Private Letter Ruling that they did not consider his/her fideicomiso to be a trust for U.S. tax purposes. Oh, and Canadian RRSPs are exempt from 3520-A filings too. Two tax jurisdictions solved, 190-something more to go! The Secretary is authorized to suspend or modify any requirement of this section if the Secretary determines that the United States has no significant tax interest in obtaining the required information. Trump says he’s going to kill a bunch of time-wasting regulations on Day One of his administration. So, are the Republicans going to keep their big promises to the diaspora? “US SS and UK SS (UK State Pension) are taxed only by the country of residence, under the US/UK Treaty. It isn’t clear to me that a UK Junior ISA in favour of a NRA child and for which the Amcit parent is trustee isn’t — strictly speaking — reportable if only because if the child dies during minority’s that parent might inherit so the parent is a potential beneficiary. On the other hand, toreport itbis asking for trouble. Not in my case, as I had renounced before the SS began. If I had started receiving US SS while still a USC I would have excluded it as exempt under treaty. Which it is. And if I had had administrative responsibility for a grandchild’s Junior ISA I definitely would not have reported it to the IRS! I’d never give anyone’s name to the IRS, let alone a grandchild. Does this nightmare ever end? As much as I am grateful for this site and all the wonderful people who have come together to help each other, I also fear it at times, but find myself returning to it on occasion to play out a twisted game I have of inspecting myself for damage and peeling the scab off of a wound that is trying to heal. Trying to become “compliant” with the US tax system almost destroyed me and has left a lot of collateral damage in my life, and I often compare my feelings to that of someone who has lived through a war and will be forever looking over their shoulder. I had a TFSA for almost a year before I had the bomb drop on me regarding my “obligations” for US tax filing (came here as a child, never worked in the US….etc…etc.) This was around 2011 and there were rumblings of the TFSA being deemed a foreign trust. The first accountant I used (who grated on my one last nerve and almost pushed me into “One Flew Over the Cuckoo’s Nest” territory) assured me that big accounting firms were taking the position that these were depository accounts and not foreign trusts. I had another tax firm confirm this position years later as well and then a third. Read specifically the section where he describes the structure of TFSA’s. I still stand firm that TFSA’s are not trusts in the traditional sense, but I’m not an accountant either and the IRS has not ruled on it yet. The problem I had was that nobody told me about form 8621 regarding my mutual funds that were inside the TFSA. I’m still not convinced I would have had to file this form, but I cannot be sure either, and at this point, should I even care? 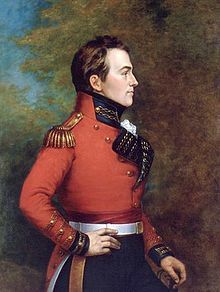 Jeffrey B. You should not care about 8621. Your mutual fund inside a TFSA is well protected. Filing 8621 would sow mass confusion. “Trust” and “IRS” in the same sentence? How is this possible? Oh wait, I got it. George Orwell explained it.